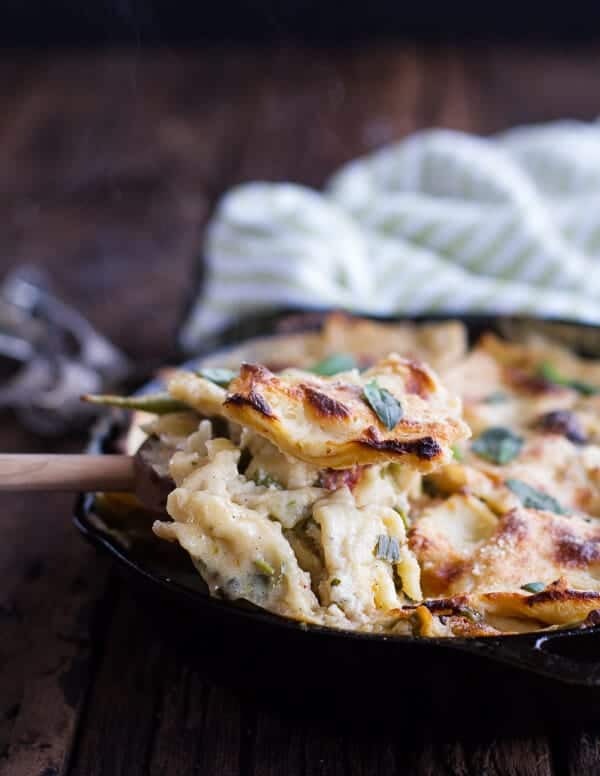 Quick and Simple Springtime Skillet Lasagna with a Mediterranean Kick. Because yesterday it snowed, and there is more snow predicted for the weekend. Seriously? Really though, I just wanted lasagna, but without all the work and layering. So skillet it was. This is one of those meals that’s perfect for the days when you come home and your feet hurt, your brain is fried and carbs are just needed. That was kind of my day yesterday. LONG. Some of it was good, some of it not so much. Unfortunately, it ended with a major fail, so that pretty much stunk. All in all it wasn’t awful, just tiring. 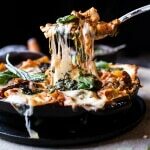 A day in need of an easy, throw it all in one skillet, add some veggies, some cheese and pasta. Pop it in the oven and call it a day. Sounds totally nice, right? Well, it totally is. Also, I feel you should know that I am kind of in a complaining mood at the moment. Meaning I feel like I could go on and on about how my oldest brother is annoying the living daylights out of me, or the snow or the fact that I am complaining about my brother’s annoying ways and not a boyfriend’s annoying ways (who has time, right?!?). Sometimes it sort of just feels good to kind of get it out of your system and then try crazy hard to forget it and never look back. And really, you have to forget it because no one wants to be called a complainer. Although, I am pretty sure that’s what my family says about me. But you guys they are just a bunch of freaks. So really, what they say is highly questionable. Well it’s a mash-up cozy spring/borderline summerish pasta. It’s creamy, but heavy on the veggies and the carbs. Yum. It’s ready in under and hour and all you have to wash is one skillet, one plate and one spoon. Yes! Added bonus, since it is extra heavy on the veg it’s totally cool to, you know eat half for dinner and save the other half for lunch, no sharing required, not even a bit. Logic people. Heat a large oven safe skillet over medium heat (mine is 12 inches). Add about 2 tablespoons of the reserved sun-dried tomato oil, the asparagus and sugar snap peas. Cover and allow the veggies to cook about 5-10 minutes or until tender crisp, stirring once or twice. Add the green onions, sun-dried tomatoes and olives. Cook another 3-5 minutes or until the onions have softened. Season with salt and pepper. Slide the veggies out onto a plate. Set aside. 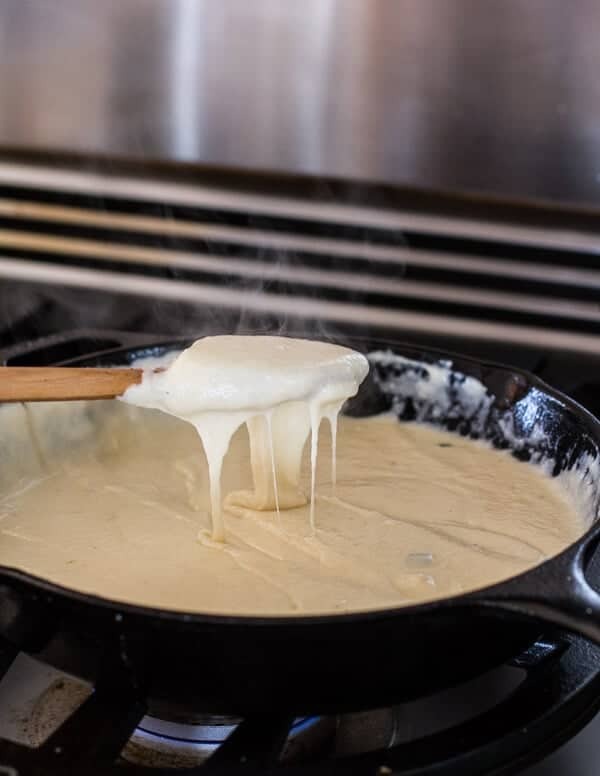 In the same skillet melt the butter over medium heat. Add the garlic and continue to cook, stirring over medium-low heat for 3 minutes or until the butter is lightly browned and the garlic is caramelized. Add the flour and cook, whisking constantly, for 1 minute. Whisk in the milk in a steady stream. Simmer for 2 minutes, whisking. Remove from the heat, stir in fontina, provolone and mozzarella. Add the crushed red peppers and season with salt and pepper. Now add the noodles and veggies to the skillet. Add the parsley and basil and carefully give the skillet a good stir, making sure everything is coated in the sauce and and in an even layer. Add the parmesan and pepperonis, if using. Place on a baking sheet and bake for 25-30 minutes or until the top is lightly golden and the cheese is bubbling. Remove from the oven and allow to cool 5 minutes. Dig in! Oh, and it’s Thursday, which basically means it’s the weekend!! Hooray! 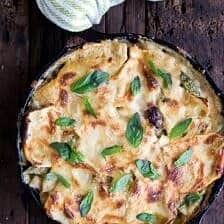 Simple Vegetarian Skillet Lasagna + Video. 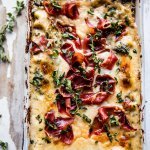 Italian Quinoa Risotto Lasagna w/Truffle Oil. 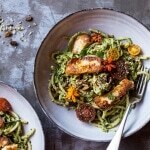 Green Goddess Zucchini Pasta with Fried Halloumi. This looks like the perfect thing for those days when you just need two forks, your best girlfriend, and a HUGE complaining session. Sometimes it just needs to be done! Oh my gosh, I love how this is rich and creamy, but also so perfect for Spring. And easy—ya gotta love easy! 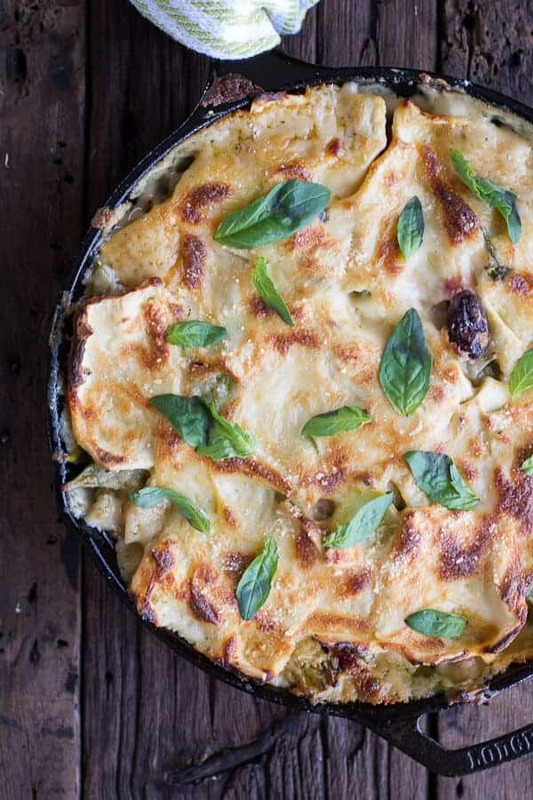 I’m totally digging the idea of putting kalamata olives and sun-dried tomatoes in lasagna! I’m right there with you on the complain-y front, too. I think it’s just been one of those weeks! Thanks Rachael!! Hope you had a great weekend! Ok..I need to stop complaining that the heat is still on because it’s so cold when you are still getting snow!!!WHAT??? I don’t think I could handle any more snow. 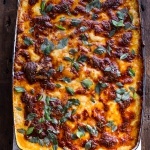 This lasagna had me at kalamata olives..luv them. This is perfect comfort food. Oh man, it’s full on snowing today and I am dying. So cold. And windy. And no fun!! Hope it gets warm where you are soon though!! This sounds fantastic Teighan! Total comfort food right here. I can’t wait to go home from school so I can make this! Wishing you better days ! This looks fantastic and I love the added olives! Thanks Kathy! I am on a huge olive kick lately! This sounds AMAZING! I am pinning this one. I forget sometimes just how amazing your recipes are. Just tried your moroccan chicken marinate from the skewers. Used it on pork and it was amazing! Your recipes teach me how to be a better cook and learn new flavors, Thanks! Aww! This makes me so happy. Thanks Sophia! Everyone has to vent! 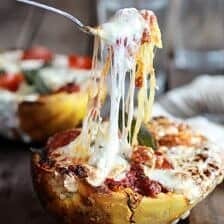 Feel free – it’s nice yo know I am not the only one 🙂 I’ve been dying to make a skillet lasagna and this one looks perfect! I need a skillet just like that one ASAP. I finally got a Ceuset dutch oven recently and now I’m dying to own a skillet just like that one…so practical for a dish like this that needs to go from the stove-top to the oven! 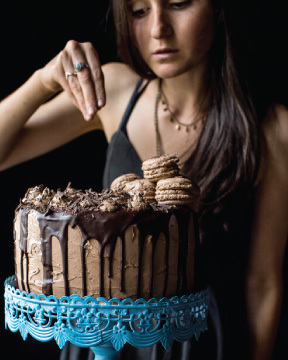 Great inspiration and I bet the leftovers would make a great packed lunch, too! You have to get a cast iron skillet, I use mine every single day. It’s must in my opinion. Gorgeous! Love all the spring veggies, the Mediterranean flavors, and the fact that it’s ready in less than an hour (and only a skillet to wash!). This looks SO flippin’ good! I love that it’s a one pan dinner, too! PHEW! Thank goodness sharing isn’t required, because I don’t want to part with a single bite! PS I got your email and will get back to you soon! Just give me till Saturday, things are a little crazy! Thanks again! This looks really really good! And I am so sorry you still have snow. It snowed last week here, and I was definitely not happy. I think I would move if we still had snow 🙂 Though living on a mountain in CO would have it’s perks! And trust me, I wonder every day why i live here. Ha! Hope for better weather soon! But this lasagna is amazing! Summer comfort at its finest!! 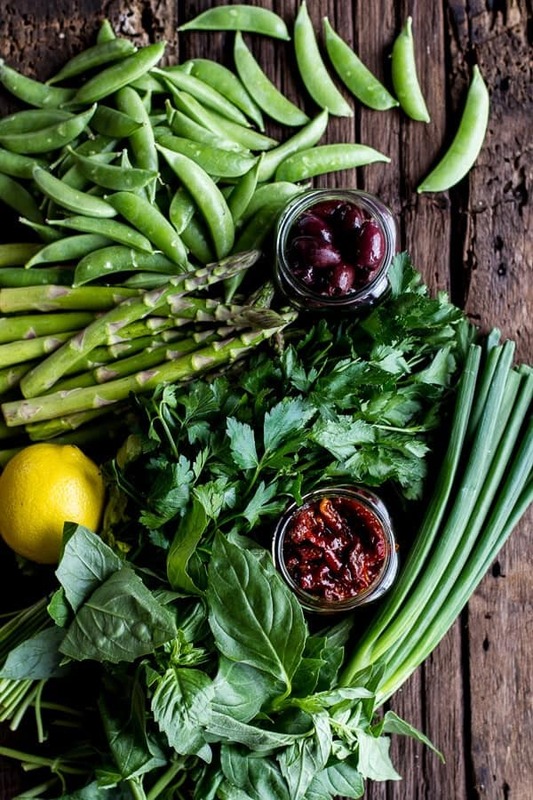 Love all the veggies and the creaminess! This looks so incredibly good. Those ingredients; it’s pure comfort food. And your photos are so beautiful. I want this now. This is my kind of dish! I love balancing naughty and nice. All the cheeeeses and all those guilt alleviating veggies. Perfect! Yum yum yum yum YUM! 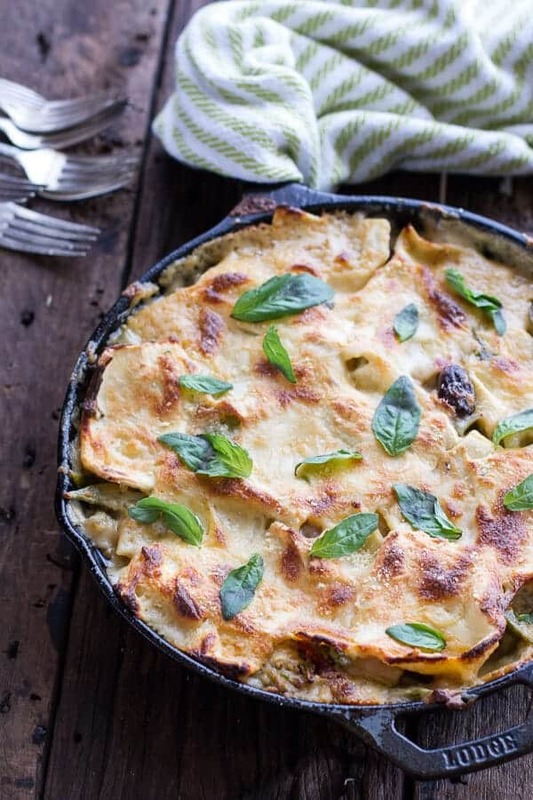 I love lasagna and love Mediterranean food, and am super intrigued especially by the idea of using peas in lasagna. I hope the snow stops soon where you are. The silver lining (for the rest of us at least) is that we get to see your delicious cold-weather-inspiried dishes like these! Oh my, that looks and sounds so yummy! I’ve never had asparagus or peas in lasagna before but it looks just perfect. Sorry you had a rough day :(. Happy weekend! Thanks Denise! Hope you are having a great weekend! 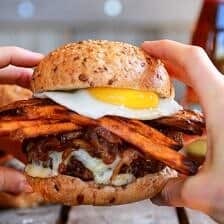 This looks like such an amazing dinner! 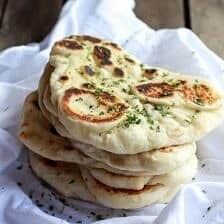 I love all the flavors in here, and that it is easy to make!! Thanks so much, Cate! Have a great Sunday! Love all the flavours! More snow- you absolutely deserve not to share! 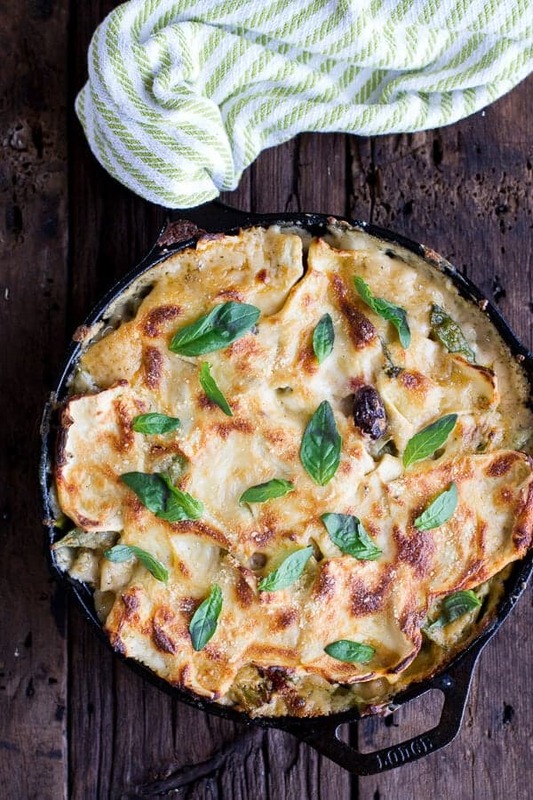 Love the basil on top- I always have some in my window sill and try to add it to as many dishes as possible! I am jealous of you basil, sounds awesome! Made this last night and loved it. Was admittedly a little nervous about the sugar snap peas being, texturally, the weird cousin in this dish, but they were a delicious touch. Very tasty. So happy you loved this, Jeff! Thanks! More snow? Poor you! I couldn’t handle getting snow in April while most everyone else was wearing shorts and flip flops! 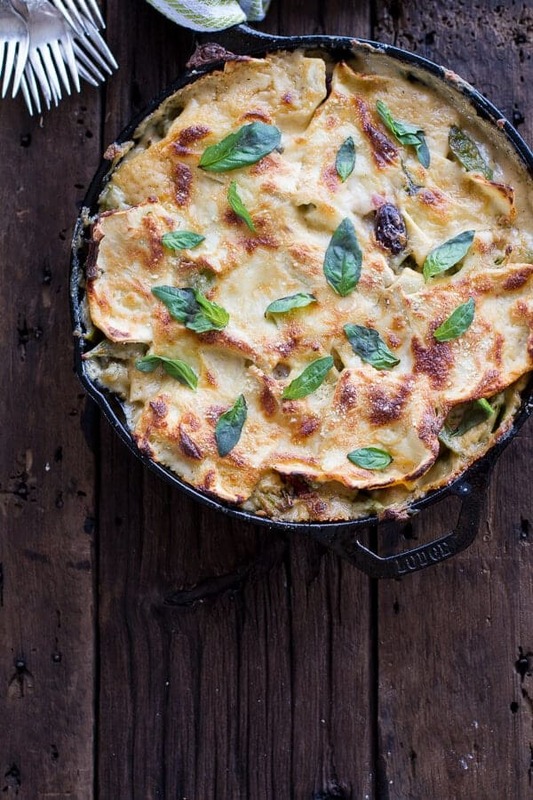 Thank goodness for amazing deliciousness like this lasagna. That’s bound to cheer up even the heaviest of hearts! 😉 Pinned! 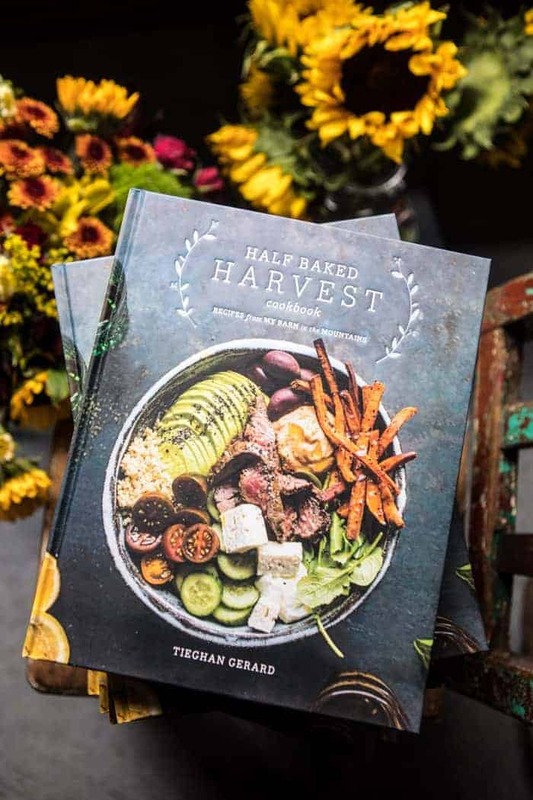 You make some killer recipes Tieghan! I love your creativity! Thanks you so much!!! that means the world! YESSS! LOVE this Tieghan! Loads of spring veg, but still plenty of pasta to keep me satisfied 😀 and that creamy sauce… omg yum. Thanks Becca!! Have a great weekend!! I forgot to mention the name 😉 it’s katharinanoire ! AWw!! Thank you so much!! So happy you guys are loving my recipes! THANKS!! Love this. 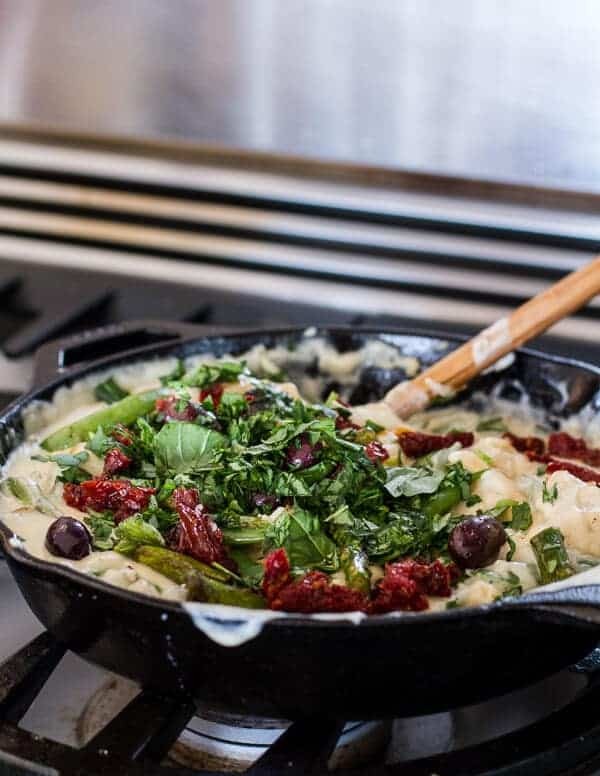 One-dish meals are perfection, and I can never say no to sun-dried tomatoes and kalamata olives. else except the Fontana I was tempted to use feta but used grated Irish cheddar cheese which melts. Followed instructions to a T (hahaha) and it was still GOOD. 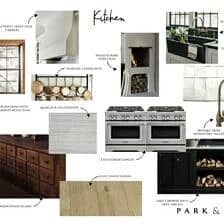 I will be making this after I hit the market. Just what I need today. Thanks. This was one of the most delicious meals I have ever made! Wonderful mix of flavors! I would love to make this for an 8-10 person dinner party. I have an extra large cast iron casserole dish. Any thoughts on making ahead and refrigerating and then baking later? Would the noodles be okay? Or could I make the sauce ahead and refrigerate that and assemble it all later? I hate cooking with guests in the house and would love to just pop this in the oven. Any help would be appreciated! I really want to share this with friends! Thanks!